Rubber-Band Launching Pen. How are you aiming? 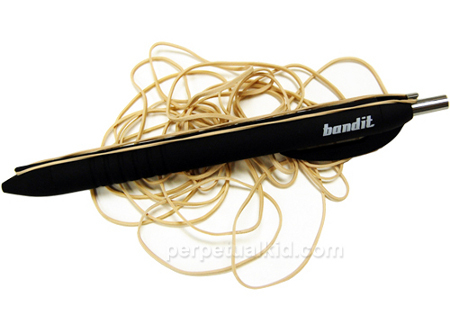 Practice with this pen launcher rubber bands and target.Eye do not be mean and give it another use. When working or studying have moments of being overwhelmed, and we need toclear our heads a little. Some do it walking around, stopping for a coffee or a cigarette ... There are many methods, I will suggest you to do so will aim anddespejeis a bit. Organize a tournament, if you want in your office mates, or among yourclassmates. Ideal gift for office mates or family who need a relaxing moment and removestress. - Pen pitcher rubber bands. The writing pen is blue. Presented in blister and not recommended for children under 8 years.